Visual LANSA is a genuine, low-code integrated development environment (IDE) that provides an easy-to-learn, high-level programing language for developing mobile, desktop, and web applications. The software enables companies to embrace the modern technology wave with a powerful business rules engine, integrated IDE, and metadata repository to make their development process highly productive. It automates routine tasks with single language IDE that simplifies web development process right from the inception to deployment. The program eliminates the complexities of modern techniques (such as Java and XML) and provides the simplest way to achieve business goals. It futureproofs your development ideas against the changing technology standards including operating systems, user interfaces, form factor, databases, scalability, security and more. Some of its main features include advanced visual development, DBMS support, component-based 00 development, integrated Microsoft C/C++ compiler, development environment, deployment platforms, promptable syntax experts, multilingual and DBCS, and dynamic multitier server & client partitioning. Visual LANSA is an easy-to-use IDE platform that allows developers to code once and deploy everywhere. It’s a cross-platform development tool that values rapid creation of enterprise-grade applications. The software exhibits quality that proves it’s more than just a productive visual IDE. It provides a self-regulating business rules engine and a rapid development & maintenance language (RDML) to expedite the development of mobile, desktop, and web applications all from a unified code base. It allows developers to optimize the current technology infrastructure including all ODBC and DB2/400 compliant databases with ease. The suite incorporates rapid prototyping tools within the business application framework. This enables developers to expediently compile and determine the necessities for prompt feedback loops. The rapid prototypes transition into the resulting application making it easier to deploy applications to Windows and the Web from one code base. Visual LANSA is built with the ease of mobile application development in mind. It eliminates the complications of mobile development from developers and allows them to create mobile web, native and hybrid mobile applications for any form factor and any device. Its low-code development architecture arms developers with innovative tools enabling them to deliver enterprise-grade mobile apps. Additionally, Visual LANSA has an offline mode that allows your users to use their mobile apps when internet connection is lost. In terms of web development, Visual LANSA provides all the vital tools envisaged by developers. It brings the flexibility that allows seasoned developers to optimize the speed of delivery while taking care of the needs of inexperienced developers who don’t have the time to master all the programming technologies. 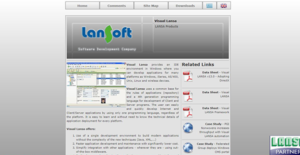 If you are considering Visual LANSA it might also be beneficial to examine other subcategories of Best IDE Software collected in our database of B2B software reviews. There are well-liked and widely used applications in each software category. But are they automatically the best fit for your company’s specific wants? A trendy software product may have thousands of users, but does it offer what you require? For this reason, do not blindly shell out for popular systems. Read at least a few Visual LANSA reviews and mull over the elements that you wish to have in the software such as the price, main features, available integrations etc. Then, shortlist a few systems that fit your wants. Try out the free trials of these products, read online reviews, get clarifications from the seller, and do your investigation systematically. This exhaustive groundwork is sure to assist you select the most excellent software solution for your company’s specific needs. How Much Does Visual LANSA Cost? We realize that when you make a decision to buy IDE Software it’s important not only to see how experts evaluate it in their reviews, but also to find out if the real people and companies that buy it are actually satisfied with the product. That’s why we’ve created our behavior-based Customer Satisfaction Algorithm™ that gathers customer reviews, comments and Visual LANSA reviews across a wide range of social media sites. The data is then presented in an easy to digest form showing how many people had positive and negative experience with Visual LANSA. With that information at hand you should be equipped to make an informed buying decision that you won’t regret. What are Visual LANSA pricing details? What integrations are available for Visual LANSA? If you need more information about Visual LANSA or you simply have a question let us know what you need and we’ll forward your request directly to the vendor.